As new fossils continue to turn up in previously underexplored places, the ROM prepares for a summer showcase of the Southern Hemisphere's most awe-inspiring dinos. The Cryolophosaurus inhabited present-day Antarctica. Dinosaur builder Peter May shows off plans for the colossal Futalognkosaurus. The five-axis milling machine in action. Research Casting International's immense workshop. Research Casting International’s immense workshop. David Evans oversees dinosaur research at the ROM. While the upcoming exhibit will feature primarily rarely seen dinosaurs from the Southern Hemisphere, the Northern Hemisphere's Tyrannosaurus rex will be there as well. While the upcoming exhibit will feature primarily rarely seen dinosaurs from the Southern Hemisphere, the Northern Hemisphere’s Tyrannosaurus rex will be there as well. Peter May has been building dinosaurs since the late 1970s. T. rex (left) and Giganotosaurus face off. Welding Suchomimus' skull onto its body. Welding Suchomimus’ skull onto its body. The skull of the North African Carcharodontosaurus was considerably larger than that of T. rex. With a crest on its head loosely resembling hair styled into a pompadour, Cryolophosaurus lived, once upon a time, in the middle of present-day Antarctica. Giganotosaurus was a carnivore, similar in size and fearsome appearance to Tyrannosaurus rex. And Futalognkosaurus, at more than 30 metres long, may well have been the largest terrestrial animal of all time. If you’ve never heard any of these names before, you’re likely not alone. Cryolophosaurus and company were among the great many dinosaurs that lived on a Mesozoic-Era supercontinent called Gondwana, which sat below the equator. The task of making and assembling the casts is giant, also. Enter Peter May. A sculptor by training, May began working with fossils at the ROM in the 1970s, and started up his own dinosaur-building company in 1986. Originally located in Toronto, Research Casting International is now stationed in a 4,600-square-metre facility in Trenton that is like a cross between an airplane hangar and a machine shop. It is here that May and his team make moulds and casts of fossils in the traditional style or, increasingly often, make 3D scans and prints instead. In order to recreate Futalognkosaurus, for instance, May travelled to Argentina to scan the fossilized elements of the dinosaur. From those scans, he will develop a digital model, which will eventually be carved out of foam on a massive milling machine. 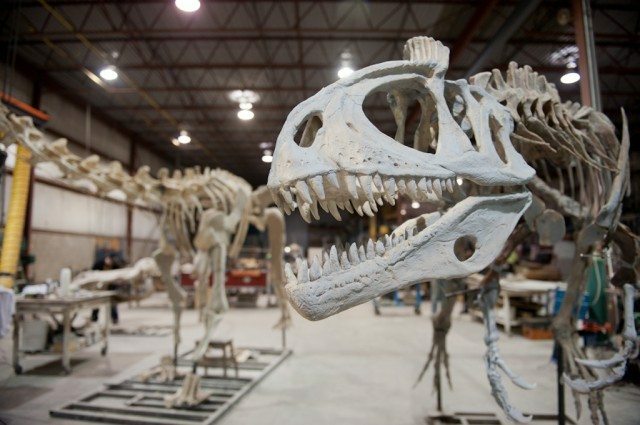 Evans—who makes regular trips to the Trenton shop to ensure the various skeletons’ faithful reconstruction and anatomic correctness—adds that the use of digital technology not only facilitates building dinosaurs, but understanding them as well. Which is fortunate because, as paleontologists take their search for fossils to previously neglected areas of the globe, more and different thighbones are going to start turning up. Because of a combination of factors like the high cost of the work, political instability in parts of South America and Africa, a surfeit of paleontologists in North America, and the logistical difficulties of hunting for bones in distant countries, much of the Southern Hemisphere’s fossil record remains undiscovered.